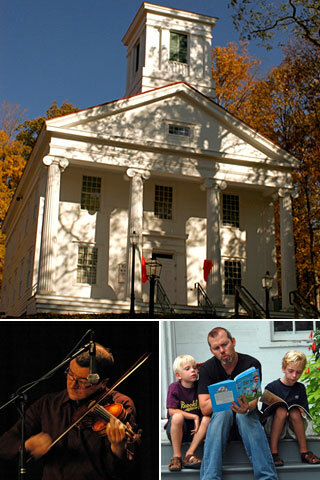 Founded in 1972, Spencertown Academy Arts Center is a cultural center and community resource serving Columbia County, the Berkshires and the Capital region. Housed in a landmark 1847 Greek Revival schoolhouse, the Academy presents a variety of free and low-cost community arts programs and events including concerts, readings, lectures, and art exhibits as well as arts-related workshops and classes for children and adults. The Festival of Books, which takes place each Labor Day weekend, the mid-winter Revels, Hidden Gardens held in June, and Handmade Holiday in December are highlights of the Academy annual events calendar. The Academy showcases local as well as nationally and internationally known artists, and also serves as a resource for smaller arts organizations, who use the space for rehearsals, performances and meetings. In addition to its on-site cultural events and programs, the Academy sponsors an extensive arts-in-education program, artsVoyage, in local public schools, bringing rich artistic experiences to hundreds of local children. 1847: The newly-built Spencertown Academy opened its doors as a coeducational teacher training facility. Later, the landmark Greek Revival building was used as a two-room schoolhouse and, in 1972, became an arts center. The Academy was founded by Timothy Woodbridge, pastor of St. Peter’s Church and cousin of Aaron Burr. The New York Times didn’t exist. The New York Post did.